For the first time, scientists have produced more energy from a reaction in a fuel source than was put into the fuel, bringing us one step closer to harnessing the power of nuclear fusion. Scientists at the Lawrence Livermore National Laboratory in California have taken a huge leap forward in the ongoing pursuit of an effective way to wield the power of nuclear fusion. 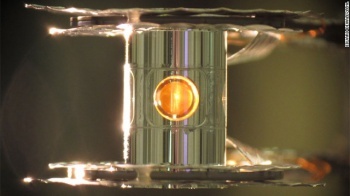 While their experiment did not yield an impressive amount of energy, it revealed a process that may point them towards a controlled, sustainable fusion reaction. Nuclear fusion is the same process that powers the Sun, and if effectively harnessed, would be a source of abundant, safe power. Omar Hurricane, the experiment's lead physicist, claims that his team produced more energy from a reaction in its fuel source than was put into the fuel. "You're not going to power a car with it. You're not going to power a house with it," Hurricane said. "It'll be a while before we address all the needed scientific challenges and then the engineering challenges to make it more practical, but we're excited. It's a great step forward scientifically." The experiment involved the implosion of a tiny pellet holding two hydrogen isotopes, and while the resulting outputted energy was not dramatic, the reaction produced a heating effect that appeared to boost the energy output. It is this effect, which Hurricane's team has dubbed "bootstrapping," which may lead scientists to eventually produce a reaction that yields more energy than it consumes. "It sounds very modest, and it is," Hurricane said. "But this is kind of closer than anyone's gotten before, and it is very unique to finally get as much energy out of the fuel as was put into the fuel."